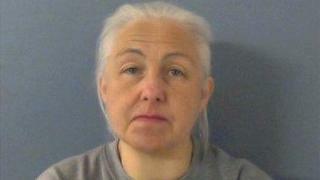 A woman who killed her husband after "systematically" abusing him and hitting him with a rolling pin has been jailed. Hannegret Donnelly, 55, controlled husband Christopher's life "through threats and beatings", police said. She had hit her 55-year-old husband with objects, including a rolling pin, and her "systematic domestic abuse" weakened his body to the point of death, police said. Image caption Donnelly told police she hit her husband with a rolling pin "to get him out of his trance"
Sentencing Donnelly at Kingston Crown Court, Mrs Justice Yip said her husband "experienced real physical suffering for a long period before his death" and it was "inconceivable he didn't also suffer mentally". The judge said it was "hard to imagine the horror" the children must have been party to, telling Donnelly: "Your children must have witnessed your repeated violence towards their father and were present when he died." Prosecutor Eloise Marshall QC said Mr Donnelly, a former music teacher, was unable to walk and had become disabled by January, but his wife inflicted "mental and physical suffering" until the time of his death. The court heard Donnelly told police there was "something strange" in their house, which had affected both her and her husband's health and even suggested he at times "welcomed the beatings".